Thank you for your interest in writing for Connect. We’re always looking for articles from our members and the broader nonprofit technology community. 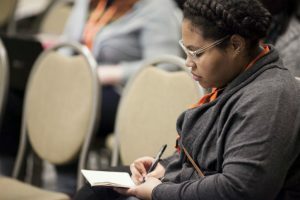 November: NTEN thank yous—What/who are staff, board, community members, Connect authors and NTEN members most thankful for this year? Automation for engagement, donors, volunteers, etc. If you have passion and/or expertise in topics related to nonprofit technology, we are looking for you! And not just writing: we’ll also consider video, comics, infographics, or other mediums. Practical. Our focus is on tips, tricks, how-to’s, how-not-to’s, and higher-level conversations that help other nonprofit professionals work better. Idea-driven. Our authors are generous experts of their own experience who share lessons learned as well as support for other community members. Member-focused. We prioritize articles written by NTEN members, but we will happily accept quality submissions from the broader nonprofit and nonprofit-serving community. Tactical and tool-agnostic. Submitted drafts that focus on specific platforms or services will not be accepted, or will be heavily edited. Relevant to nonprofits. Link bait, press releases, or open invitations to demo a product or service will be rejected. Tactics don’t have to be nonprofit-specific but should be relevant to the nonprofit technology community. Humor and opinion pieces welcome. 700–1,200 words. Longer pieces may not be accepted, or may be heavily edited or split into more than one post. Leaders. Authors are primarily NTEN members, or are active members of the NTEN community—people who have spoken at or participated in community-based events (such as Nonprofit Tech Clubs or online groups), attendees and faculty of NTEN educational events or programs, etc. Diverse. We strive to ensure a diversity of perspectives and voices, including but not limited to: gender identity, race, geographic location, job type, and organization size and type. We generally do not publish more than two pieces by any one organization in a calendar year, to ensure a diversity of community voices. Before pitching, check out what other authors have written on your topic. Email editor@nten.org to pitch your idea. We publish approximately twice per week. If your pitch is accepted, we’ll discuss deadline and publication date at that point. We will edit the piece to conform to our site style and will consult with you if there are bigger edits that need to be made. You’ll also be asked to submit a short bio and profile picture. We offer a $50 honorarium to authors, to help us increase the diversity of voices on our blog. Once your article is published on the NTEN site, we will send you an email with the link to your article. We’ll promote it on our social media channels and link to your Twitter handle if it was provided. Social media sharing of your own is encouraged, as is sharing with friends via email, newsletters, and any other platform at your disposal. We will send web traffic stats on request. Connect features resources on the latest nonprofit technology topics and trends from innovators in the field. Our Connect Monthly email goes out to over 27,000 of the most influential leaders in the world of nonprofit technology. Find out more and get in touch.